We are observing an increasing number of great tools that help facilitate the intricate process that is deep learning, making it both more accessible and more efficient. Every problem worth solving needs great tools for support. Deep learning is no exception. If anything, it is a realm in which good tooling will become ever more important over the coming years. We are still in the relatively early days of the deep learning supernova, with many deep learning engineers and enthusiasts hacking their own way into efficient processes. However, we are also observing an increasing number of great tools that help facilitate the intricate process that is deep learning, making it both more accessible and more efficient. As deep learning is steadily spreading from the work of researchers and pundits into a broader field of both DL enthusiasts looking to move into the field (accessibility), and growing engineering teams that are looking to streamline their processes and reduce complexity (efficiency), we have put together an overview of the best DL tools. To better evaluate tools that can foster accessibility and efficiency in deep learning, let’s first take a look at what the process actually looks like. At Luminovo, we work hard to create tools that make our engineers more efficient, as well as leverage the powerful tools that brilliant deep learning folks out there have created. 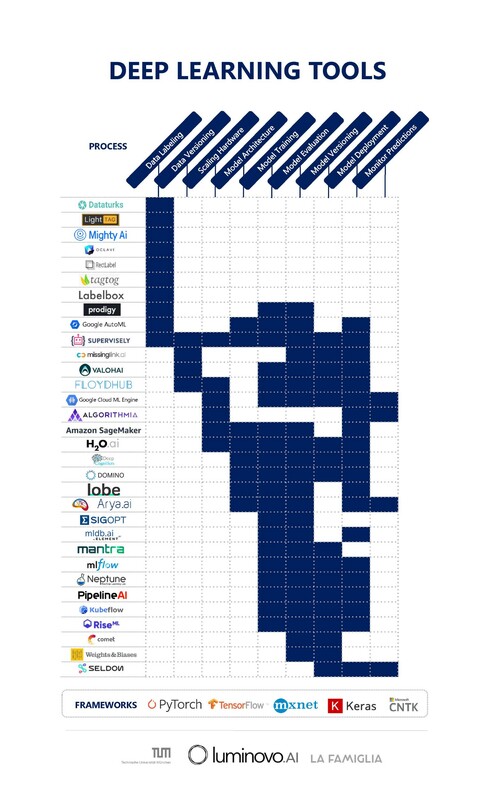 Great code is meant to be shared, so the following graph presents an overview of the most promising deep learning tools currently in the market. From DL engineers for DL engineers and all those keen to learn more about creating awesome deep learning applications. For a PDF with clickable links for the different tools, go here. Hold on — your favorite tool is missing?! Let us know so we can add it to the list and advance the state of deep learning in the wild together: tooling@luminovo.ai. The landscape was created in collaboration with La Famiglia and TU Munich. Bio: Timon Ruban is a Co-founder of Luminovo on a mission to make AI easily usable and widely used.